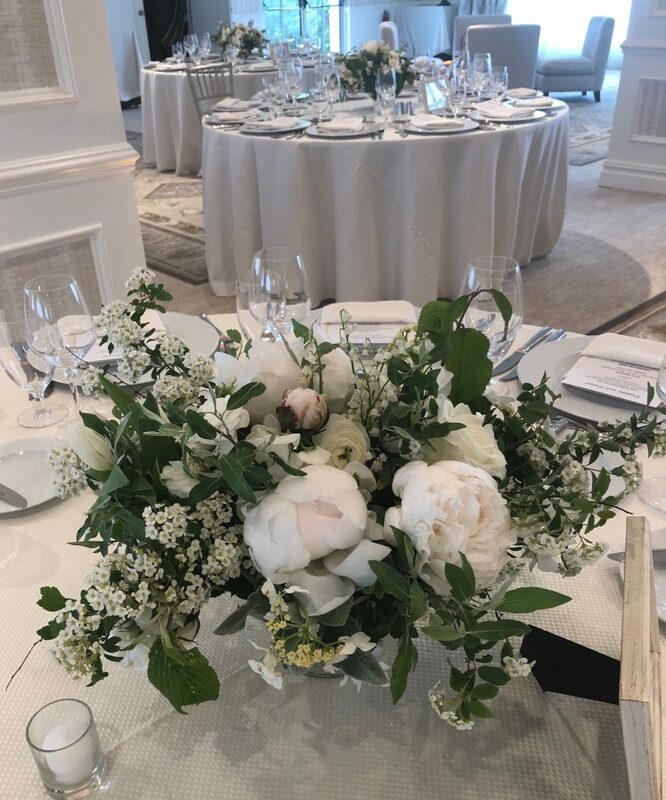 Garden style flower arrangements make stunning table centerpieces. A good seasonal arrangement for me looks as if you just picked the flowers from the garden and placed them in a container without fussing. My arrangements are loose, airy and not fussy. This look is easy to achieve so long as you follow a few tips. 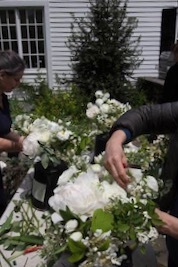 5 Tips for Stunning Garden Style Flower Arrangements. When I begin any flower arrangement, I always start by thinking of my arrangement as a little garden. Each arrangement is a small landscape complete with trees, turf, bushes, and flowers. I make sure to capture all these elements to create a whimsical, eye-catching arrangement. Arranging flowers in my garden. First, look and see what you have growing in your backyard garden. 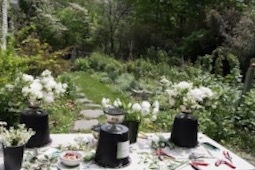 Most American backyard gardens, in the North East, are landscaped typically with Azalea bushes, Rhododendrons, Spirea, Forsythia, Holly and Evergreen trees, etc. These all can be used to form what I call the “Structure.” Cut these branches to begin establishing the foundation and perimeter of the vase. Cut three or four beautiful branches with exciting curves to begin filling your vase. Place them to define your height and width. The”grass” in your garden is its foundation. It frames the garden, right? Well, consider the lip or base of the vase it too needs to be covered with a foundation green. For these arrangements, I used Lamb’s ear growing in my backyard garden. 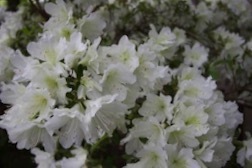 It spreads rather quickly and looks pretty both in the garden and in vases. Bonus? 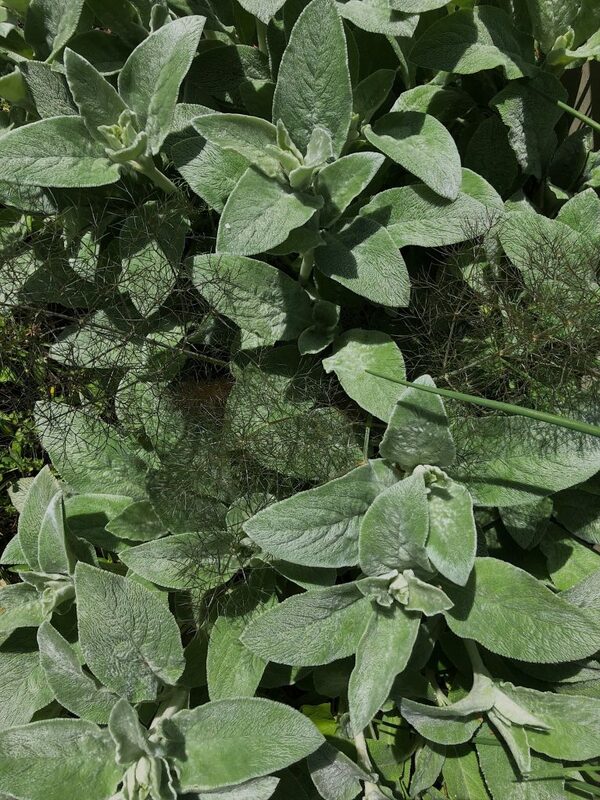 Lamb’s ear is deer resistant. Herbs to use in my flower arrangements. The goal is to cover the base of your container while adding texture to the arrangement with leaves. I honestly, like to use at least three varieties, but one works beautifully. Again look to see what is in your garden, maybe you are growing grasses, low growing evergreens that are bushy, Pachysandra, Periwinkle, or Ivy. All of these last in water while adding a fantastic textural base to cover. I find that most American homes are not landscaped to grow flowers. They are landscaped to be “low maintenance,” which means we’ve detached ourselves from growing flowers in our backyards. So what about the flowers? Your Focal flowers are typically your prize flowers. 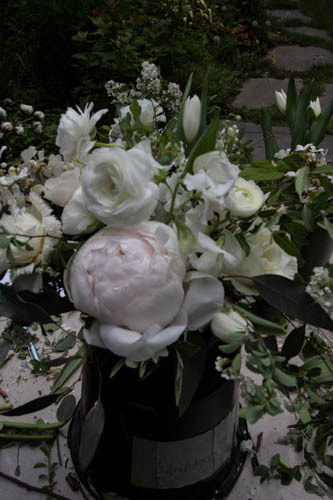 In this arrangement, I used Peonies. 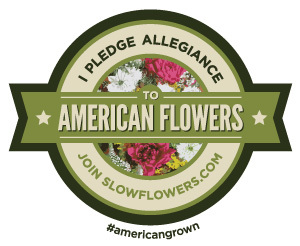 So here is where you can begin growing your very own flower garden. 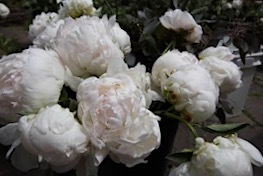 When we bought our old farmhouse, I found a few peonies plants but not much else. I divided them every other year, and now I have a massive collection of big beautiful blooms. Another variety of flowers I’ve been adding are roses. I currently have over thirty-six rose bushes that I’ve counted so far this year. It takes time to establish a perennial garden. So be patient with yourself. If you want to start growing flowers start with the ones that take longest to develop into cutting flowers. If you intend to grow flowers and have a “Fast American Landscaped backyard,” here are links that will help you get started. Flower arrangements inspired by the garden. These are flowers smaller in size to the Focal flowers, and I place them tucked in and out to frame the Focal flowers. 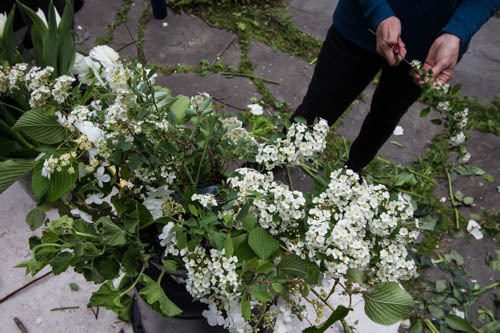 For this wedding, I used Spirea the actual flowers from flowering bushes, which are in season. The whimsical touches are what creates that sense of wonder to my arrangements. It warrants a second glance to see “what’s that flower?” Here I add locally grown Ranunculus and Sweet Peas as one of the delicate blooms peaking atop the arrangement. 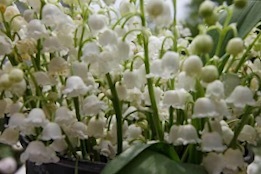 But my crowning glory this time was my garden Lily-of-the-Valley, which grows like a weed. So there you have it a quick guide to how you can begin to think like an in-season flower designer. Use what is growing in your yard/garden even if you are not gardening flowers. You can find something to cut to bring in your home. A branch, a fern leaf even grasses. Bringing nature in the house is an excellent way to keep oneself in balance with the seasons and the moment. 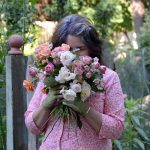 I’d love to see your garden style flower arrangements. If you are on Twitter or Instagram be sure to tag me in your posts as I’d love to know if these tips were helpful to you!